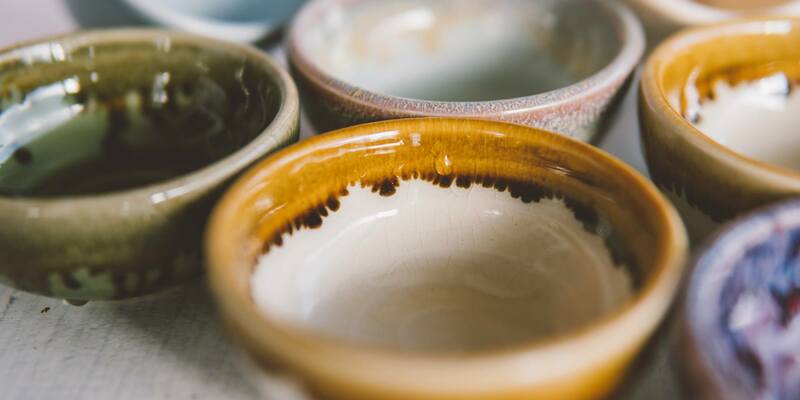 Deneen Pottery creates and distributes handmade pottery throughout the United States. Our website design for their handmade products helped drive them to have the best year in 40 years in terms of sales, and their website got more search engine visitors that stayed longer than they had in the life of the company’s site. 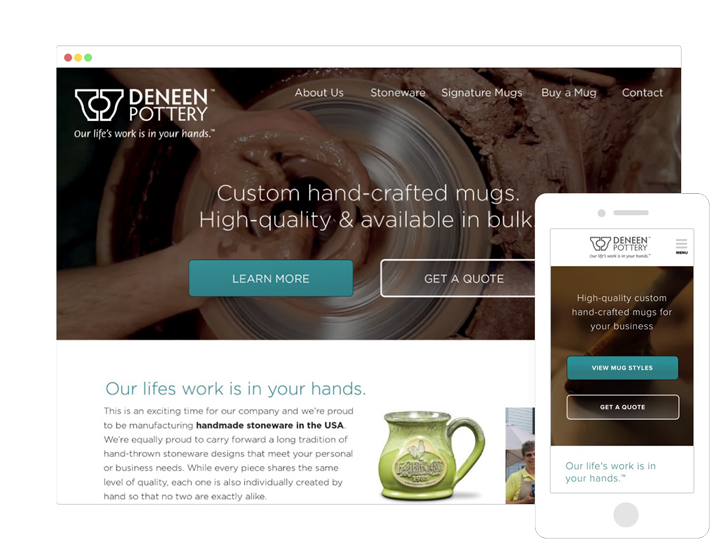 To gain more visibility on the web, Deneen Pottery enlisted Snap to massively step up their web presence. The old website wasn’t all that bad, but it was dropping the ball at crucial points in the online sales process. Calls-to-action weren’t properly linked, crucial features such as a “mug map” were difficult to use and—worst of all—their site wasn’t mobile-friendly. With more than 30 percent of their website traffic browsing on mobile, you can see why they needed the help of the experts at Snap. 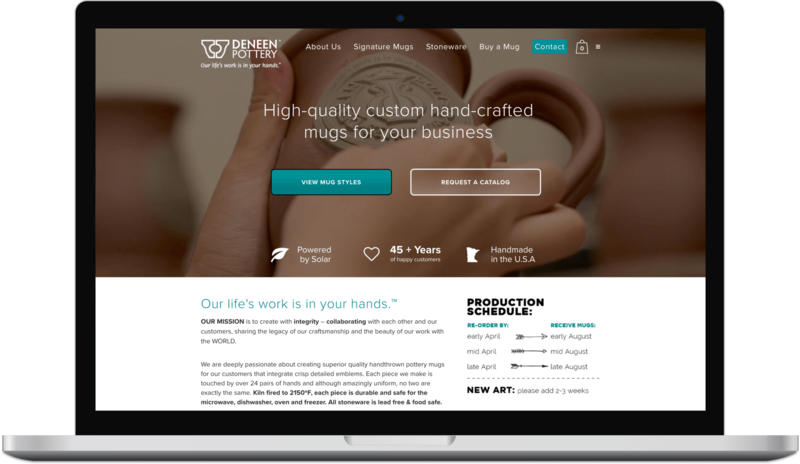 Beyond this, a major opportunity was finding the true differentiating factors of Deneen Pottery’s main value proposition and showcasing it in a visually compelling way. In doing this, plus building out content on their site, we were able to capture more traffic in people’s searches on Google, and other search engines, and convert those visitors into customers. Not that every website design needs to be award-winning, but we do try. But what’s more important than the three awards (and counting) that our solution won is the amount of traffic and customers the site brought in. And when we see opportunities and believe in a company, we couldn’t be prouder of our role in their success—no matter the percent our website redesign had to do with it (their products are amazing). As a market-leading business, we knew we needed to step up our game to improve Deneen’s site. We needed to showcase the handmade aspect of the product by leveraging the unique employees and processes. With some amazing video assets, we built the Deneen process right into the background of their home page. On their old site this video was simply background noise. With the new site, we brought it to the forefront by prominently displaying it for all to see. We determined the main items visitors wanted to find quickly and made them immediately available through the use of big beautiful call-to-action buttons. “View Mug Styles” and “Get a Quote” are prominently featured and given the royal treatment. Through the appropriate placement of messaging throughout the site’s layout, we can display the handmade aspect through text as well. 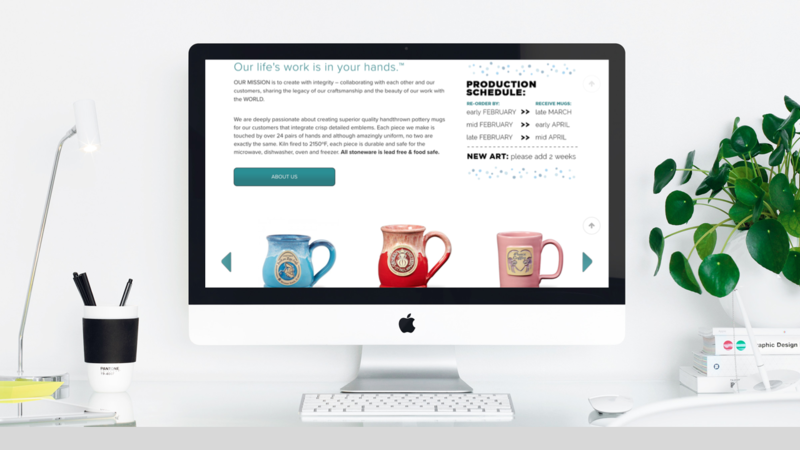 Now the typical site visitor understands that the mugs are for businesses, and they know Deneen is family-owned and based in the United States. Through user testing of their old site, we determined that visitors want to see real individuals and not just models interacting with the mugs. We suggested developing a section devoted to real customers excited about their products, which was a real suggestion from a user we tested. User testing really sharpens the intuition of designers for current projects and any projects they design thereafter. Watching people interact with a redesigned site allows the designer to see their pain points and make adjustments accordingly. If we can help you create an award-winning, traffic-driving, money-making website, let us know with the contact form below. Interested in creating a gorgeous website for your business? Then don’t hesitate to call or message Snap Agency. Our team can provide all of the digital marketing services your organization needs to ensure long-term business success.